The CNS OSINT team did it again. While doing what one does on the weekend, looking at DPRK missile bases, Jeffrey and his team found a new missile base. In this week’s episode, Aaron and Jeffrey talk through the finding, Josh Pollack’s meta op-ed on what OSINT means in today’s media environment, and how OSINT can be used to support the policy process and hold leaders feet to the fire. A Canadian discusses the month’s North Korea-related developments with some special guests. For November, Andrea is joined by Cristina Varriale of the Royal United Services Institute, and Hamish Macdonald of the Korea Risk Group. They talk through announcements about postponed meetings, joint military exercises, inter-Korean projects and Chinese border infrastructure. Oh, and puppies. Pompeo says meeting with Kim Yong Chol is postponed. Mattis announces that a scaled-down version of the Foal Eagle exercises will go forward in spring. Reuters on the sanctions exemption for inter-Korean rail survey activities. Hamish’s investigation into the slew of infrastructure development projects along the China-North Korea border. French national charged with treason for supposedly passing information to North Korea. With the US on the precipice of withdrawing from the INF, all eyes have turned to China and its large number of INF range missiles. The think tank community has followed and a bevy of think pieces on basing modes in Asia have been published. On this week’s episode, Jeffrey and Aaron talk about the cost of the BGM-109G and some of the implications of putting them on land... in the Pacific. A Canadian reviews the month’s North Korea news together with a special guest. Andrea and Ramon Pacheco-Pardo, the Korea Foundation-Free University Brussels Korea Chair, look at Pompeo’s latest visit to Pyongyang, examine the outcomes of Moon Jae-in’s European tour, and talk about the North Korean middleman now on an FBI Most Wanted poster. Details of Pompeo’s October visit to Pyongyang. NY Times, “South Korea backtracks on easing sanctions after Trump comment”, 11 October 2018. Ramon’s article for NK News, examining what Moon Jae-in achieved and didn’t on his recent trip to Europe. The Pope indicates his willingness to visit Pyongyang. Department of Justice press release concerning the indictment of Singaporean national Tan Wee Beng, for his alleged dealings with North Korea. The end of arms control, or a sub-culture run amok? In today’s special, live-recorded edition of the Arms Control Wonk podcast, Aaron and Jeffrey talk about the end of the INF, John Bolton's motivations, and the reasons behind the US pull-out (aka the Stormy Daniels). An Era Without Arms Control? Is Russia Cheating on the INF Treaty? This was the very first Arms Control Wonk Podcast episode! Aaron and Jeffrey return to the topic to discuss the potential for a New Start extension and what it could mean for the future of the US-Russian relationship. US Ambassador to NATO, Kay Bailey Hutchinson, made some news. And not in a good way. She was trying to say that the US would develop countervailing capabilities -- something that started under the Obama Administration and that almost no one disagrees with. source played in corroborating the report. This episode brought to you by Jeffrey's new novel, The 2020 Commission Report. Ellen Nakashima and Joby Warrick's article in the Washington Post about ICBM production at Sanum-Dong. Ankit Panda's Diplomat article on continuing ICBM production in North Korea. Jeffrey's new book, The 2020 Commission Report on the North Korean Nuclear Attacks Against the United States - A Speculative Novel, can be preordered here! We have the (probable) location of North Korea's original enrichment site: Kangson, now called Chollima. This is probably the spot where the DPRK has been enriching uranium since the early 2000's, which has previously not been openly identified! Ankit's bombshell article in The Diplomat about Kangson. A Canadian reviews the last month’s news with two special guests. Andrea talks to CNS Senior Research Associate Melissa Hanham and FAS Adjunct Fellow Ankit Panda as they go through the trajectory of U.S./DPRK diplomacy after the Singapore Summit, parse through the differences between U.S and DPRK public statements, and developments within the U.S./ROK Alliance. 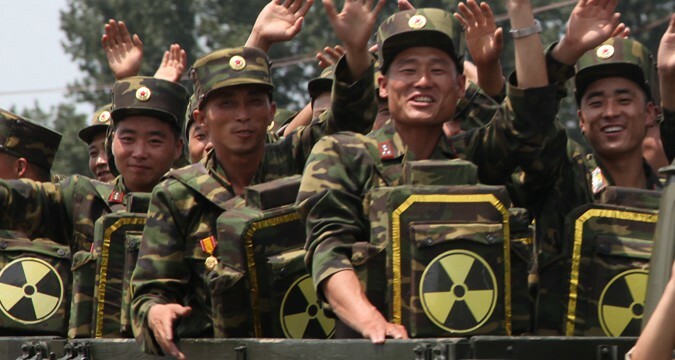 NBC report on North Korea's additional enrichment sites and increased nuclear activity. Ankit's article in The Diplomat about the DPRK's additional missile TEL production in 2018. Kim Jong Un said he is closing the nuclear test site at Punggye-ri. But if outside inspectors and exports aren't allowed in, it could just be a PR stunt with no substantive contribution to "denuclearization." Jeffrey and Aaron talk about what this means for North Korea, why inspectors and outside experts need to be allowed in, and what the upcoming Trump-Kim summit may lead to. CNS/MIIS research on the possibility that the nuclear test site at Punggye-ri is possibly being dismantled right now. A Canadian reviews the last few weeks of North Korea news with a special guest. Andrea chats with Antoine Bondaz from the Foundation for Strategic Research in Paris. They dissect the optics and outcomes of the recent inter-Korean summit, analyse the responses, and look at some of the stories you may have missed amongst the flashbulbs. Full text of the Panmunjom declaration, signed by Moon Jae In and Kim Jong Un. Rodong Sinmun’s reporting on the summit the following day. Articles here, here, and here. Australia and Canada sending planes to monitor illicit DPRK shipping activity. UK sending ships to monitor the same. Bibi showed off Iran’s bomb. And its pretty crappy. The slide show added some titillating details to what the world already knew about Iran’s nuclear weapons program and, in doing so, made the case for why the JCPOA is so important. The real news was not the documents or their provenance, but what they revealed about Iran’s nuclear weapons planning. They wanted a few bombs in the basement. Literally. Jeffrey and Aaron talk this week about the Iranian nuclear weapons program, how Bibi added to what we already knew about their program, and why the JCPOA is important to verify that Iran’s bomb program remains confined to dusty files in binders and CDs in a dilapidated warehouse. Jeffrey's Twitter thread walking through the presentation, step-by-step. Joshua Pollack's Defense One article on the presentation. A Canadian reviews the last few weeks of North Korea news with a special guest. Andrea talks to Ramon Pacheco-Pardo from King’s College London about DPRK summit mania. They cover the recent high-level visits to Pyongyang, Beijing and Washington, consider North Korean pledges to refrain from certain nuclear and missile testing, and debate whether this is all a house of cards. Ramon’s take on the forthcoming inter-Korean summit, for War on the Rocks. Yonhap on the Pompeo visit to Pyongyang, one of several ROK outlets creating an echo chamber for the Asahi Shimbun story. The North Korean statement pledging to suspend ICBM testing and nuclear testing at the “northern” test ground. Scott’s analysis of the recent North Korean test freeze pledge, for NK News. Haaretz dropped an incredible article with new details about the 2007 Israeli air strike on the nascent Syrian nuclear reactor at Al Kibar. So we thought it would be a good opportunity to interrupt Jeffrey's working vacation to talk about Al Kibar, the North Korean nuclear connection, and how our understanding of the event has evolved over the past decade. The Haaretz article with all the details on the strike on Al Kibar. One reader's trip to the Syrian archaeological site near Al Kibar that should not, and we cannot emphasize this enough, ever be tried again. Discussions on the details of the reactor. Some US IC statements about Al Kibar. Al Kibar being overrun during the Civil War. A Canadian reviews the last month's North Korea news with two special guests, Jeffrey and Aaron. It's a family pod! Andrea discusses the new UN Panel of Experts report on North Korea's illicit arms dealing, whether the DPRK is helping reconstitute the Syrian chemical weapons program, and some long awaited discussions on Myanmar's acquisition of North Korean ballistic missile systems. The New Panel of Experts Report! The rest of the PoE reports, if you would like some light reading. DPRK Foreign Ministry response to "maximum pressure" statements. What is Russia’s nuclear doctrine? Jeffrey talks to Dr. Olga Oliker about Russian nuclear doctrine and developments. Unfortunately, she speaks Russian, which turns out to he really inconvenient for a lot of people's theories. Jeffrey and Olga discuss whether escalate to deescalate is a thing and Putin’s awesome new menagerie of terror weapons. Dr. Oliker's hosts a podcast, Russian Roulette, with Jeffrey Mankoff over at CSIS. It can be found here, go take a listen! The Russian chemical weapons attack in Salisbury is, sadly, not the first assassination to take place on UK soil. Jeffrey and Aaron spoke about Russia’s use of a Novichok nerve agent, what this act says about a return of Soviet patterns of behavior, and some policy options. The Stimson Center report, Chemical Weapons Disarmament in Russia: Problems and Prospects. President Trump announced that he's going to meet with Kim Jong Un. He seems to think that Kim Jong Un is giving up his weapons. Kim Jong Un seems to think that Trump is recognizing North Korea as a nuclear power. What could possibly go wrong? Jeffrey and Aaron discuss before Sarah Sanders walks this back. A delegation from South Korea visited Kim Jong Un in Pyongyang. After a sumptuous lunch and what looked like a little boozy, over-the-top happy Kim Jong Un waved goodbye as the South Korean delegation drove off with promises. Aaron and Jeffrey talk about the ROK's post-lunch (not launch, for once) statement, the history of DPRK negotiations, and what could go wrong and right with the talks on the Korean Peninsula. Statements on the inter-Korean meeting. Mark Fitzpatrick's article on the Leap Day Deal and how U.S./DPRK parallel statements differed in 2012. Two Canadians review the last month of North Korean developments as they try to ignore Canada's Olympic performance in curling and hockey. Andrea talks to Matt Korda about Olympic diplomacy, DPRK proliferation networks, maritime deception practices, and the most recent set of sanctions. The transcript of the 2008 Burmese military delegation visit to Pyongyang. The Panel of Experts Report covered in Reuters. An update to Olympic Diplomacy: The ROK Delegation meets with Kim Jong Un in Pyongyang this week. Russian president Vladimir Putin presented his annual address yesterday. The Russian Ministry of Defense has opened up voting on some of the new systems' names... if you wanna vote, vote here. We’re back. After a brief hiatus, Jeffrey and Aaron return from their myriad trips. The show documents Aaron and superproducer Scott’s visit to missile central down at joint-base Anacostia, where the two got an up close and personal viewing of the Qiam/Burkan 2-H and other assorted Iranian made goodies on display. Jeffrey then filled Aaron in on his trip to the Munich Security Conference and his assorted medical ailments while traveling through out Germany. Our two prior episodes on the Iranian materiel display, one focusing on the Qiam/Burkan 2-H and one focusing on the Qasef-1. Our series of six episodes discussing strategic stability, European security, and the Russian/INF problem. See episode description for links! A Canadian reviews the last two months' North Korea news with a special guest. Andrea talks to Scott LaFoy for a whirlwind tour of December and January's developments. They cover Kim Jong Un's New Years Address, the Vancouver Foreign Ministers Meeting, and those pesky ship-to-ship transfers the North Koreans are so fond of these days. Andrea's pre-mortem of the Vancouver Meeting at Arms Control Wonk. Andrea's discussion of the Olympic exchanges and negotiations over at The Diplomat. Scott and Fyodor Tertitskiy's NK Pro article on the Olympic Negotiations. Full text of Kim Jong Un's 'op ed' in KCNA/Rodong Sinmun. VOA link, safe for clicking in South Korea! India launched the Agni-V intermediate-range ballistic missile. Launch a missile, get a pod. Aaron is skiing in Vail, so The Diplomat's Ankit Panda joins Jeffrey to discuss India's nuclear and missile programs from rail mobile missiles to the guy who flooded India's only ballistic missile submarine. Ankit's Twitter thread on Agni test imagery. Ankit and Prashanth Parameswaran did an excellent pod over at The Diplomat covering the Arihant and the Agni V.
A draft of the Trump Administration's Nuclear Posture Review has leaked -- and its a doozy. Aaron and Jeffrey discuss the history of these reviews and recommendations to develop a new sea-launched cruise missile and a variable yield warhead for the Trident D5 submarine launched ballistic missile. The Huffpost article that originally leaked the document. The 2010 Nuclear Posture Review from the Obama administration. The Trump Administration is naming names, confirming what Jeffrey has long said — that the new cruise missile Russia is building in violation of the 1987 INF Treaty is the 9M729, which is known in the US as the SSC-8 Screwdriver. Aaron and Jeffrey discuss Russia’s violation of the INF Treaty, offering a deep dive on the new ground-launched cruise missile and the RS-26 intermediate-range ballistic missile. We usually avoid chasing Trump’s tweets but when the President of the United States says his button is bigger than Kim Jong Un's ... well, we’re not made of stone. Aaron and Jeffrey talk about whether Trump is bluffing and what the disarray in the White House says about policy process issues. The tweet in question and a backup in case it disappears.